Seabirds apparently have a surprising new predator to worry about. 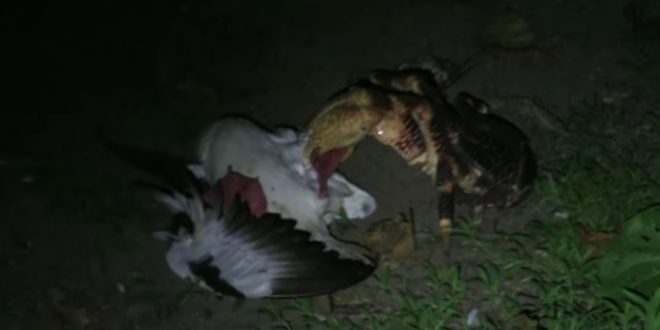 A researcher who worked on the Chagos Islands in the Indian Ocean in 2016 says he witnessed a large coconut crab attack a sleeping seabird, which then became dinner. Last week, National Geographic unearthed the rare and gruesome sight of a coconut crab—which typically lives on land and eats coconuts—stalking, stabbing, and then devouring a red-footed booby as it slept. In a quick two-minute span, researchers captured the crab break both of the bird’s wings, crush its bones, and render it helpless. Thankfully, scientists cut the camera off once the feeding frenzy began, watching in horror as five other coconut crabs crept over the bird, disemboweling and eating it alive. “It was pretty gruesome,” scientist Mark Laidre told the New Scientist. Aside from being metal as hell and a little bit voyeuristic, the footage Laidre captured is apparently revelatory. Coconut crabs had been known to eat meat before, but according to the New Scientist, they weren’t known for also hunting creatures down. This brutal crab-bird dissection probably isn’t a one-off, either: According to Laidre, the birds tend to stay away from certain crab-infested islands, ostensibly to keep from being massacred. “In areas where these guys are present and abundant, it would be a smart move, especially among ground-nesting birds, not to place eggs there,” Laidre told the New Scientist.